"A classic summer combination -- using fresh peaches makes the recipe work so much better. Other fruits in season could be substituted." Preheat the oven to 375 (F); for sea-level, preheat the oven to 325 (F). Put 1 cup flour, 3/4 cup sugar, 1 teaspoon baking powder*, 3 tablespoons butter, and a pinch of salt in a freestanding electric mixer with a paddle attachment (or use a handheld electric whisk) and beat on slow speed until you get a sandy consistency and everything is combined. Gradually pour in half of the milk (approximately 1/4 cup plus 1/2 tablespoon*) and beat until the milk is just incorporated. Whisk 1 egg, 1/4 teaspoon vanilla, and remaining milk (approximately 1/4 cup plus 1/2 tablespoon*) together in a separate bowl for a few seconds, then pour into the flour mixture and continue beating until just incorporated. Scrape any unmixed ingredients from the side of the bowl with a rubber spatula, and continue mixing for a couple more minutes until the batter is smooth. Do not overmix. Divide the sliced peaches between paper cases lined in a muffin tin so that the base of each case is covered. 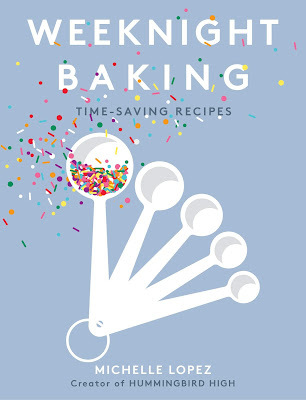 Spoon the cupcake batter on top until two-thirds full and bake in the preheated oven for 20 - 25 minutes, or until light golden and the cake bounces back when touched. A skewer inserted in the center should come out clean. Let the cupcakes cool slightly in the pan before turning out onto a wire rack to cool completely. 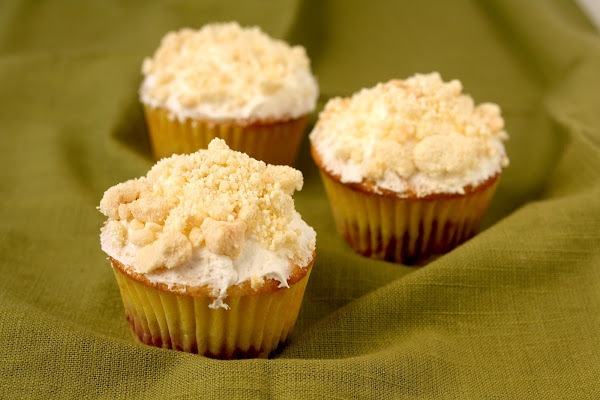 When the cupcakes are cold, spoon the Vanilla Buttercream Frosting (recipe follows) on top. Beat together 2 cups confectioners' sugar and 5 tablespoons butter together in a freestanding electric mixer with a paddle attachment on medium-slow speed until the mixture comes together and is well mixed. Combine 2 tablespoons milk and a few drops of vanilla in a separate bowl. Then, turn the mixer down to a slower speed and add the milk-vanilla mixture to the powdered sugar-butter mixture a couple of teaspoons at a time. Once all the milk has been incorporated, turn the mixer up to high speed and continue beating until the frosting is light and fluffy, at least 5 minutes. Divide your 3/4 cup milk powder into two portions -- one 1/2 cup portion, and one 1/4 cup portion. Preheat the oven to 250 (F). Combine the first 1/2 cup portion of milk powder with 1/4 cup flour, 2 tablespoons cornstarch, 2 tablespoons sugar, and 1/2 teaspoon salt in a medium bowl. Whisk together until combined. Add 4 tablespoons melted butter and toss, using a rubber spatula, until the mixture starts to come together and form small clusters. Spread the clusters on a parchment- or Silpat-lined sheet pan and bake for 20 minutes. The crumbs should be sandy at that point, and your kitchen should smell like buttery heaven. Cool the crumbs completely. Crumble any milk crumb clusters that are larger than 1/2 inch in diameter, and put the crumbs in a medium bowl. Add the second 1/4 cup portion of milk crumbs and whisk together until it is evenly distributed throughout the mixture. 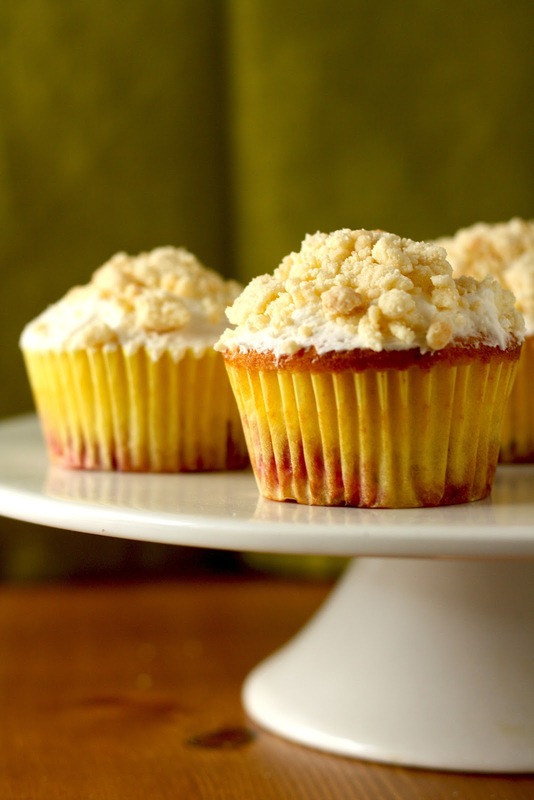 Like The Hummingbird Bakery Cookbook advises, feel free to substitute peaches for any other fruit that's in season! I actually used Japanese white peaches since the Asian supermarket I shopped at had some good-looking ones in store. Just be sure you have enough fruit to cover the base of the cupcake so you can get that pretty layered cupcake effect. After adding the milk and eggs to the flour mixture, don't overbeat as this will overwork the flour and make the cake dense -- simply beat until the milk and eggs have just been incorporated. In my opinion, making sure you don't overbeat the batter is one of the hardest parts about baking. Be sure you remember to line your cupcake papers with fruit at the bottom before putting batter on them; if you forget, you cannot simply just put the peaches on top of the batter! 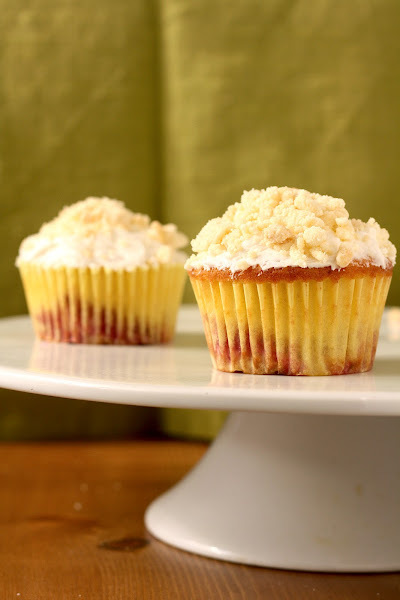 Doing so will cause the cupcakes to rise unevenly around the fruit. Although the cupcakes will still be edible, you won't get perfectly domed cupcake tops. I like to use a 1 tablespoon-sized cookie scoop to divide the cupcake batter evenly between cupcake cases. For this recipe, I put 2 tablespoons of cupcake batter in each case. The bake time for these cupcakes can very from batch to batch, depending on the ripeness of the peaches. Riper peaches will be moister and will need a longer baking time. 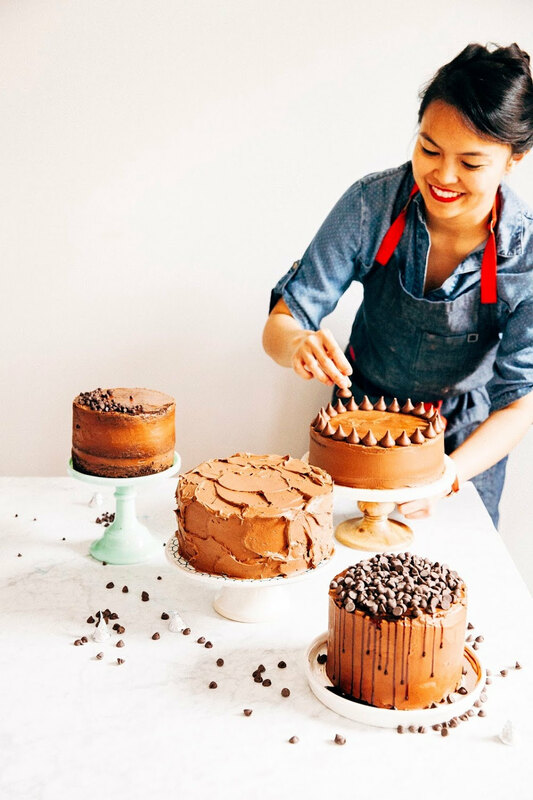 Only take cupcakes out of the oven when a skewer inserted in the middle of each cake can be removed cleanly. If you're having the opposite problem and the peaches at the bottom of the cupcake are getting burned, you can "sandwich" the peaches with batter in order to prevent them from doing so. For instance, put one tablespoon of batter, followed by a layer of fruit, and top that off with another tablespoon of batter. So long as you don't put the fruit on top of the batter, the cupcakes will still rise nicely and dome beautifully in the oven. Specifically for the Vanilla Buttercream Frosting: the longer you beat the frosting, the fluffier and lighter it becomes. I recommend a beating time of at least 5 minutes. Again, to ensure consistency, I like to use a 1 tablespoon-sized cookie scoop to measure out 1 tablespoon of frosting for each cupcake. 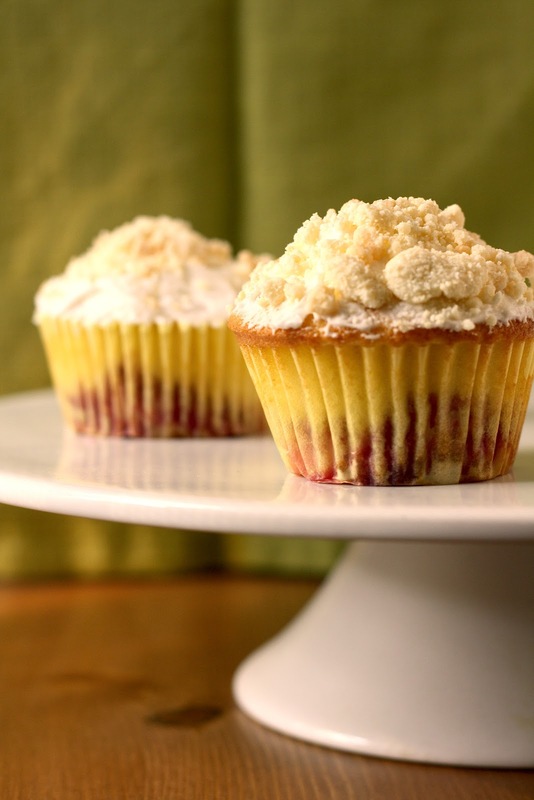 The recipe for Cream Crumb Topping makes more than what's needed for 12 cupcakes. 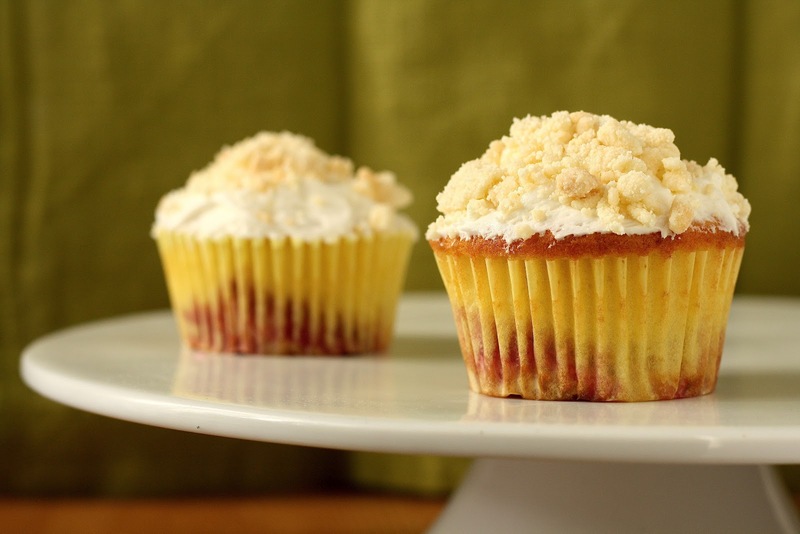 Simply cut the recipe in half, or, save the excess crumbs to top with other cupcakes or even pie. The crumbs will keep in the fridge or freezer for a month. Directions in this recipe are PERFECT!! Thank you so much--these were a big hit and it was a fun way to use a the season's bounty! Great! That's so good to hear. Thanks for giving the recipe a try! I'm glad they were a big hit. Your cupcakes are looking delicious. Will try this at home!!! 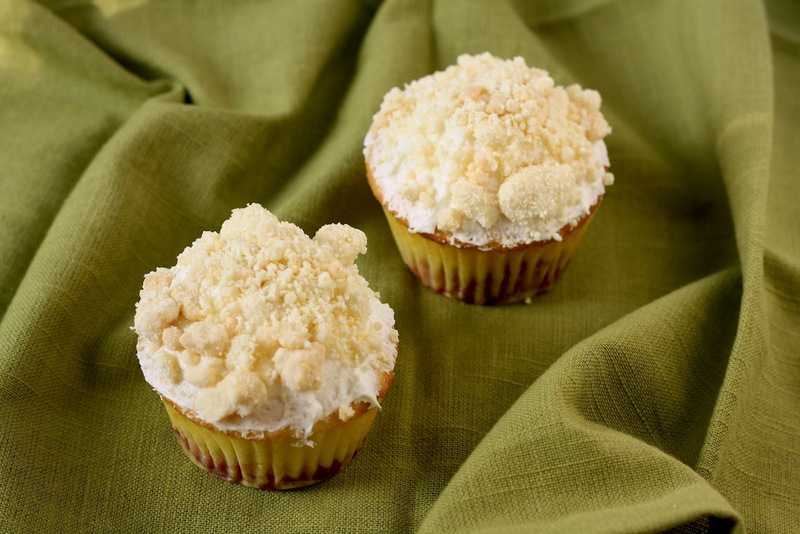 Thanks for sharing these delicious cupcake recipe. I am sure my kids will love these!! I like the recipe very much. I will try it soon.